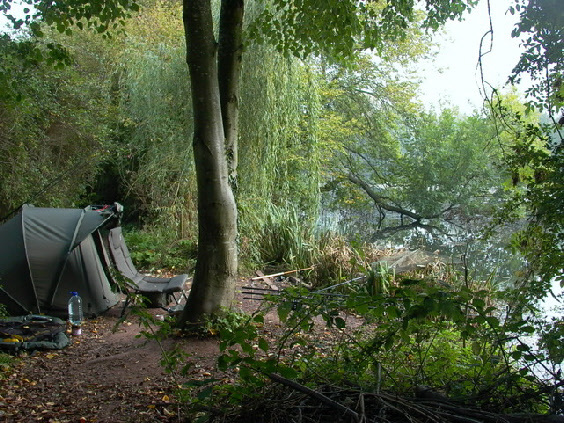 For many years Redmire Pool occupied a unique position in the carp fishing world. Access was limited to the very few anglers’ who were members of the Redmire syndicates. Winter sessions are much easier to get hold of. Very often tickets are available long after the summer sessions are sold out (summer is June 16 to October 20). Certainly worth a phone call to Les if you are interested. The prices are on the Redmire website and you can book seven day sessions, five day sessions and weekends. A weekend session is from Friday 1.00pm to Sunday 12.00am. Five days from Sunday 1.00pm to Friday at 12.00pm and a week session is Sunday 1.00pm to Sunday 12.00am. I remembered all too clearly the October rain, the wind and the mud…. So, all through this year I had been keeping a careful eye out on the weather, noticing that everything seemed to be happening about two weeks later than last year. Trees were coming into leaf later, a brief conversation with an angling friend who happens to be a gardener, said that flowers were about two weeks later too… all following the long, cold winter we had last year. So, perhaps everything would similarly be delayed by the time October came around and I would be enjoying similar conditions in my October session as last years anglers did in September at Redmire…Some hope. The weather on the drive up was mixed. A check on the SatNav showed conditions at Redmire to be overcast with possible rain. Southerly winds (nice) would be blowing through most of the week with rain forecast for the middle of the week, possibly torrential rain, certainly gale force winds (not so nice). Fabulous. Another wet and muddy week at Redmire. 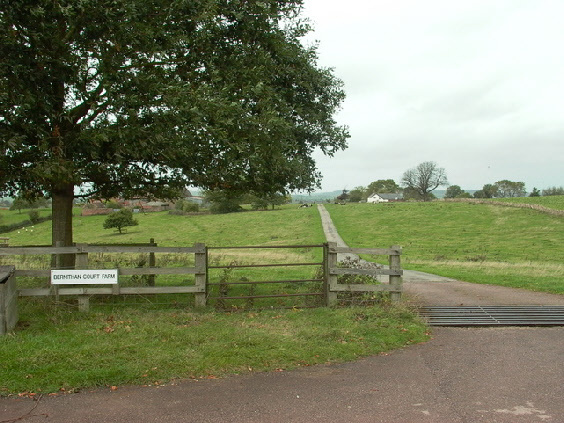 I turned right at the bottom of the lane and stopped in front of the gate next to the two farm cottages, opened it in an excited hurry and drove down to the pool. You can’t see Redmire Pool from the farm. In fact you can’t even see the water from the track leading down to the dam wall, or the track leading to the gate at the car park between the dam wall and the Evening Pitch. (The bit Chris Yates cycles down at the beginning of Passion for Angling). You have to go through the car park gate before you see your first sign of water… and you are only three or four yards away when you finally do. For some reason, just at that point, I feel completely relaxed and totally at home…But it doesn’t last. Redmire has this ability to remove any sense of confidence, undo any planning you may have done and negate any preparation you may have taken over the months leading up to your visit. It’s as if you have never even held a rod, let alone fished for carp for years and years as I have done. It’s probably the history of the place. The records of failures of far better anglers than I will ever be. The disappointments of anglers like BB. The trials and tribulations of Chris Yates over the years. Richard Walker and the need he found to develop new tactics and even new tackle to be able to even compete with the monsters than once lurked beneath the waters at Redmire. The four anglers that should have already left an hour ago or more were still there. The two from London had caught a decent fish and a couple of small ‘scamps’ (traditionally, ‘pasties’ are called ‘scamps’ at Redmire, possibly from Chris Yates’ references to them from Casting at the Sun, possibly earlier. Whatever the origin, it is a much more respectful name for the smaller Redmire fish). The two anglers from Liverpool had both blanked although they seemed very excited about having been there. I felt sorry for them later when it was discovered that they had left a wheelbarrow full of rubbish, left over from their weekend, complete with food wrappers, bacon, and god knows whatever else. There is zero tolerance at Redmire for anglers breaking the rules, particularly not clearing up behind you. Robert Fox, the bailiff, had phoned Les Bamford and they were banned, probably even before the hapless anglers had got home and regaled their friends with their stories of Redmire and the dreams of going back next year. A hard lesson. But one for everyone thinking of going in the future. It’s Redmire Pool. Don’t **** up. Anyway, having spoken to the four anglers leaving, I made my way over to the Willow Pitch which was to be my home for the week. The original Willow Pitch, were Richard Walker landed Clarissa at 44lb for a new record all those years ago is the first swim on the western bank of Redmire. The actual original pitch is now occupied by the new boathouse with the punt moored up against it. The original willow tree that gave the swim its name, was lost in a storm some years ago and was replaced last year. I was amazed at how much it had grown in the past twelve months and speaking to Robert Fox about it later in the week, he said he is expecting it to be touching water next year. The swim I went into, although known now as Willow Pitch is probably more accurately referred to as ‘In Willow’. I managed to get my Armo up within a couple of minutes and looked up to find myself staring at two fairly grim looking individuals dressed in 1950’s clothing, cords, green wool jackets, looking at me with obvious distaste. I noticed a slightly less fierce chap, longish blond hair and a camouflage jacket looking slightly embarrassed just beyond them. I immediately assumed I had bumped into one or both of the Richardson’s’ and maybe a bailiff doing the rounds over the ‘changeover’. It turned out they were my fishing partners for the week, and far from being grim, they were quite an entertaining group. They just thought I was from the previous session and was still packing up. I got the sense that they were both hoping for the swim I had collared, hence the grim expressions. I played dumb. I told them I had just arrived and had only that minute set up my Armo. I think they just about believed me, but I had a sense that they had thought I had purposely arrived very earlier in order to bag the Willow Pitch for myself. Not true of course, but to even say that to them seemed to me to confirm their suspicions, so I kept quiet and spoke to them of Redmire, cane rods, Kelly Kettles and Walker and Yates. My gear at Willow Pitch, Redmire. As I said before, there is something about Redmire that makes me forget all my planning, all my carefully considered tactics and my carefully thought out approach to each swim, all the preparation, everything. So, in true ‘Bill at Redmire’ style, I chucked out all three rods, two with the dried out remains of the boilies from my previous fishing trip three days earlier, midway across the pool near the dam wall with the fourth rod, my 1957 B James and Son Richard Walker MkIV, complete with early Mitchell 300 reel was baited with sweetcorn and chucked out to the left in front of the overhanging Alder. Err. It isn’t really like that. First, the weed. Last October the weed was more or less gone. Still there of course, ragged little bits at various places around the pool, but manageable. This year the weed was very much more in evidence. It was dying off of course, but that made it an even more difficult proposition. Redmire carp graze. They will feed on the weed, in the weed and around the weed. In the summer, a popular tactic amongst those that ‘know’, is to use very small inline leads of an ounce or less, a short hooklink and a semi-buoyant or buoyant bait, cast into the weed with a generous amount of PVA foam to help the whole assembly to sit on top of the weed. A few freebies are then thrown out and off you go. Sounds a bit too easy, but many, many Redmire carp have been caught using this tactic. Unfortunately the weed was on its way out. It was frustrating too. It became clear very early on that the large number of bubbles seen all around the pool were not from feeding carp as we first hoped, but from gasses released as the weed detached itself from the bottom of the pool to float up to the surface, there to join the other wayward weed platforms that were gathering on the pool surface. Dying weed causes me problems. I’m OK with no weed and I’m OK when the weed is young and strong and virile. The decrepit weed I found this October was a nightmare to deal with. I couldn’t go searching for clear patches, either by leading around or by using a full marker set up as the weed was coming off so easily that the difference in feel between a clear silty patch and the dying, readily released, slimy weed was difficult to detect. Slightly harder surfaces were fish had been feeding were very small gaps between the weed and would have necessitated a vertical drop through the weed of some eight feet into a hole the size of a dustbin lid from twenty or thirty yards away. Trying casting to that. A boat would have been an answer. And the punt is mentioned in rule number one. ‘Use of the punt is not allowed’. And I have already mentioned just how strict the Redmire bailiffs are when it comes to the rules. And quite rightly so. But. And this is a big ‘but’. There is no mention of other boats at all. I know baitboats are allowed, not that they would do you much good anyway… not without a very clear view of where you were dropping your baits, so OK for the margins under trees I suppose, as you can climb and look down fairly easily. The water is invariably very clear and it's not a particularly deep pool. No., I was thinking of an inflatable. Maybe next year that is what I should do. Buy myself an inflatable boat and take it to Redmire, find the feeding areas and bait and place rigs from the boat. May be easy to set up the line back to the rods in such a way that we get the minimum amount of visibility with the maximum indication. Maybe using floats or cork balls even. Hmmm… worth thinking about. Marsh Island (it’s basically one tree with a bit of hard soil around the base of the trunk) was accessible for a change. No need to use the sunken scaffold board that criss-crosses the shallows to allow anglers to move around over the marshy ground. On went my virtually useless Fox glasses and a few Redmire carp sprang into view. Nothing huge, but at least two upper doubles and three or four singles were milling around in the lower shallows beneath the sunken willow. I watched them for about half an hour. They looked eminently catchable. I carefully made my way out of the shallows and then a quiet walk back, rod and bait in hand. I sat in the tree for another hour or so until the light was no longer enough for me to see. They returned after a while, of course, but always looked skittish.. They were certainly aware of my presence and the one time I cast a line in, when they had gone off for a few minutes on a patrol past the willow and back, as they had done several times since I was had been watching them, but they never came back. I made my way back to my swim and cast out my rods again. This time I put fresh baits on and tried to pick my spots. At ten minutes past ten that night, I had my first Redmire carp! It was on sweetcorn on my MkIV under the tree to my left, in the Willow Pitch. 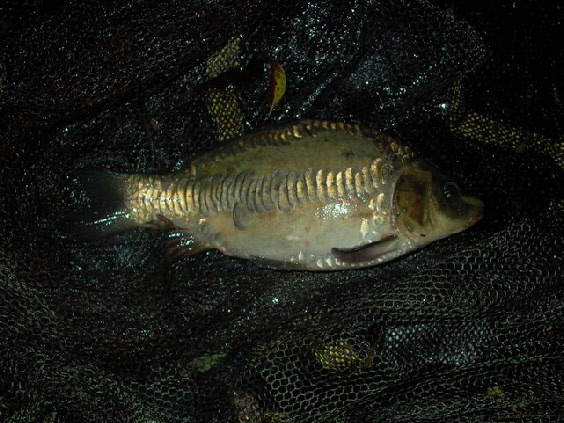 A mirror carp. Stunning! The only downside was it that it weighed less than two pounds. I’m guessing of course, because I didn’t actually weigh it. Didn’t seem to be any point. My first Redmire carp. Stunning fish, but It would be lucky to reach two pounds in weight. A quick picture and back it went. There didn’t seem to be any point in waking up the others (a tradition again, of Redmire, where any carp caught is worthy of celebration). Back to bed. At seven in the morning, the next day, I was woken by a single beep on my alarm. I looked over at my ATTX receiver and saw a single red light.. which quickly disappeared. Then another single beep…! I looked over with one eye and wondered…. Suddenly, the alarm just roared off. ****! A run! I rolled out of my bag and got out of my bivvy. The door was open, so no problem there, I had just zipped it open from the top down, to about a foot off the ground, in order to keep the infamous Redmire Rats out, so getting to the rod was not a problem. What was a problem, well at the time it seemed to me to be, was the fact that it had rained overnight and my swim outside my bivvy was just a sheet of mud. Worse, I had managed to knock one of my bivvy slippers off as I exited my Armo at speed to hit the run. So there I was, one foot in my shoes, one foot in the cold, wet, sticky mud with an angry Redmire carp at the other end of the line! At first I tried to ignore it but soon found that my foot was cold and was sliding around. I felt the carp on. Two very hard shakes of its head, one to one side, one to the other (I love braid - tells you everything). It felt a very good fish. My 3.5 NG was bent almost double and the fish felt very securely hooked. But the voice compelling me to make my way back to my bivvy triumphed, and, telling myself I had hooked and landed loads of carp of this size over the years, walked backwards, collected my other bivvy slipper, put it on and turned to refocus my full attention to playing my carp in. I wound in, still hoping the fish had somehow managed to run towards me and that it was still on, although I knew it wasn’t. I had felt the line go. A break or a hook pull? I couldn’t tell. There was no lead and it felt like I had lost all my end tackle, so a break off then? Snag somewhere? Damaged braid? What had happened? I got my end tackle out. The lead had gone, dropped almost immediately after hooking. ESP clips. Miles better than the arguably dangerous Korda clips. So I was pleased with that. Leadcore fully intact… Oh ****…no hooklink! Had the swivel come off the clip…? No. The hooklink looked as if it had broken at the knot. Damn… Bloody ESP. Then I remembered, when I was tying up some rigs I remembered testing them and finding that one or two would either break at the knot or slide out of the coating unless I used a figure of eight knot and left a fairly long tag. I thought I had thrown away all the ones I had made like that. Obviously not. So it wasn’t ‘bloody ESP’ at all… it was my own fault. Maybe if I had loosened off the clutch? No… it would still have undone at some point…. But the doubt is still there of course. I played that fish over and over in my mind all the rest of the week. I had lost a decent Redmire fish on my first morning. Over something I had failed to do properly a few weeks earlier. Effing Idiot…. With a heavy heart I walked over the dam wall towards Gil, fishing in the Stumps swim for some tea. I was still shaking from the frustration of losing a decent fish at Redmire… Am I fated to follow in the steps of ‘BB’ and Fred Taylor, never to catch a ‘proper’ carp from Redmire…? I showed Gil the remains of my hooklink. Richard came over, full of sympathy. Although we had all just met, there seemed to be a bond developing between us all. We all wanted to catch of course, but it was almost as if we were all fishing for each other too, to complete the Redmire experience. Amazing. Looking around Gil’s swim I couldn't help but smile. Three original Optonics, two MkIV cane rods in place, baits out, a third MkIV leaning against the tree to the left of his swim. To the side of his bivvy was a cane and brass original style Walker landing net. After a cup of Earl Grey, with water boiled on a Kelly Kettle, we discussed what we should do about the rubbish left by the Liverpool guys by the old pumphouse. It was decided I should ring Robert Fox the bailiff and ask… I had some bin liners, but there was an awful lot of it and the Redmire rats would have been partying every night unless we got rid of it immediately. I phoned Robert and he said he would be round later that afternoon. It was just before eight in the morning. So, with my lost fish still playing over and over in my mind I wandered back to the Willow Swim and decided what I would do with the day. I decided that, given the fact I had seen fish in the shallows the previous day, there would be the place to start. I picked up my MkIV, baited it with sweetcorn, grabbed my net and mat and wandered down. The west bank of Redmire is the place of dreams… it really is. As you walk down the length you go past all the famous swims. 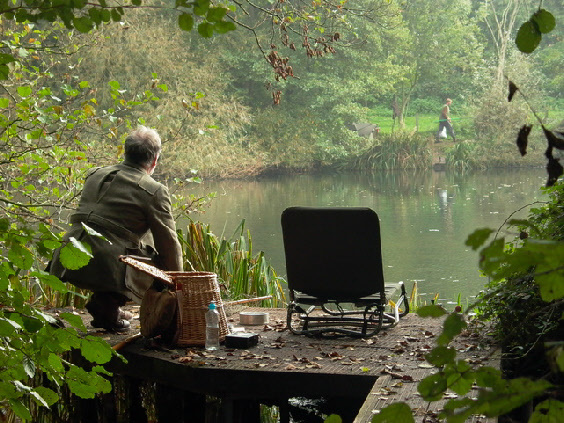 Willow Pitch were Walker landed Clarissa, Inghams, were Maurice Ingham loved to fish, Stile, Keffords, past the three islands were Chris Yates caught his first fish from the surface at Redmire whilst being filmed by Hugh Miles in Passion for Angling. Past Woodcote platform where The Bishop tried to get into the Alder and Willows roots when Chris Yates had hooked her from the other side of the pool the night he broke the record at 51 ½ pounds.. past Rod’s Willow (Rod Hutchinson of course…), through Snake Thicket and down to the very end of the shallows. It was decidedly swampy down there. Picking carefully over the old stream bed I deposited my rod, jacket and bait bag at the base of a small willow and wandered back to Swamp Island to have a look. What a sight! There were carp everywhere! Nothing enormous, but every now and again a larger twenty would slowly sail into view, dorsals cutting the water surface, milling around. They seemed to be coming in from the middle of the pool, swimming right up through to almost the very end of the shallows were the water is no more than two feet deep and then circle round the sunken willow before making their way up the pool towards ‘35’ and Woodcote and sitting there for a while before venturing back. They didn’t appear to be feeding particularly, but every now and again a big red mist would appear in the water where a carp had gone down and was pulling away at the red silt. Clouds and clouds of it… Ah Redmire….! I slowly picked my way through the swampy ground back to my rods and cast out a freelined grain of Enterprise plastic corn and some real stuff and threw in a small handful of loose offerings. I lay my rod across the top of some reeds, ducked behind them out of view and pulled the line across the surface film so I could watch the line for a take. Satisfied that all was well, I sat down on my jacket in the mud, lit a cigarette and waited. Nothing happening after an hour or so, so I walked round to Rods Willow, climbed up a bit and looked in. Most of the loose sweetcorn I had thrown in was gone. My hookbait stood out against the reddy brown silt, untouched on the bottom. Carp were still moving around, but not quite so many of them now… and the ducks were moving in…. ****. I walked back round to my rod, wound in, re-baited and cast again. Having laid the line once more in a slight arc to the right of the reeds I was hiding behind I got out another ciggie and watched. Within minutes, the line started to straighten and move increasingly faster across the surface… a fish! I stood quickly and looked to see if I could see the dark shape of a large carp moving out of the shallows towing my line… But no, It was a moorhen, with my sweetcorn firmly clamped into it’s beak but thankfully, the hook was hanging loose by the side. Thank god I had opted for a hair rather than side-hooked sweetcorn… I really didn’t fancy trying to unhook an extremely pissed off moorhen… A sharp tug and the sweetcorn was out… moorhen scuttling away angrily. Phew! Another look around and even fewer carp on view.. They must be moving up the pool.. Then suddenly, from right under my nose, a large twenty plus common leaped out of the water. A few seconds later it did it again, then again, this time almost tail-walking across the surface. It looked stunning. Dark bronze and gold in colour. An amazing fish. It was moving further and further way, not quickly, but almost as if it knew I was there and decided to have fun by showing itself in all it’s glory, mocking my pathetically crude attempts to catch such a wondrous beast. After an hour I realised it was never going to happen. I decided to drive into Ross for some provisions. No sooner had I got back into my swim I heard an alarm and some excited voices from the other side of the lake, looking up I saw that Richard was in…! I dropped my stuff and ran round just in time to see the net lift a stunning golden common from the water. Richard had caught the first ‘proper’ fish from our week. 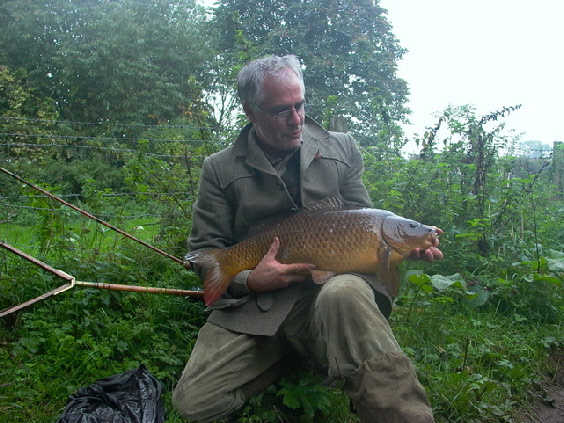 And caught on a MKIV cane rod and landed with a Walker net and it was on the Heron alarm too… RW would have been proud! We weighed it with great ceremony and found it reached exactly seventeen pounds. Not huge by today's standards, but a stunning fish. 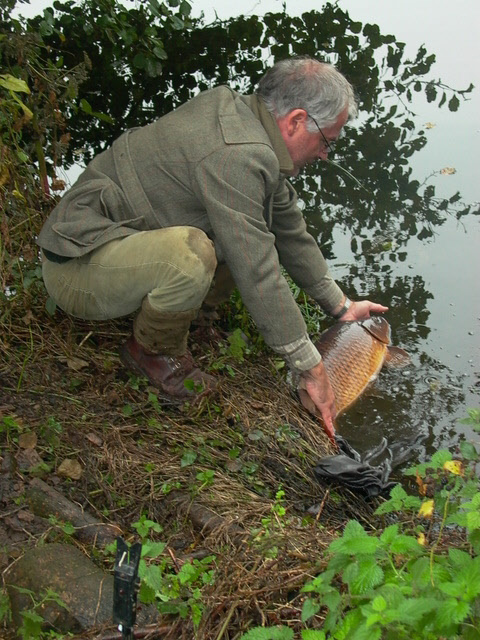 After several photographs Richard returned the fish to Redmire. It was real traditional carp fishing. Even the look of the carp, and its size, added to the feeling that we had somehow gone back in time and were experiencing Redmire as it would have been in the late fifties and early sixties. What an unbelievable experience! On the way past the pump-house I decided to go and have a look at the log of the past few weeks' fishing to see what had been caught. September had been quite remarkable, with a few twenties, lots of upper-doubles and the big mirror out at 31lb 2oz. That same angler had also had two different twenties in that same weekend session…. There was also a note to say that all twenties and above were to be photographed and copies supplied to Les Bamford so they could keep a check on the fish and that all commons below about four or five pounds had to be placed in the cage near the dam. These would then be placed in the lower pool and used for restocking later if it ever became necessary. All mirrors, regardless of size, were to stay in the main pool. An interesting and informative fifteen minutes reading the logs… if you are ever at Redmire, it's time well spent. A quick trip into Ross for the afternoon and then by four I was back in my swim getting ready for the evening. I had just the kettle on when I heard a Land Rover approaching from over in the farm direction. A few minutes later it had parked in the car park near the Evening Swim and a tall blond chap and a small terrier got out and walked over to the pump-house. It must be Robert Fox; the Redmire bailiff, he had said he would be down sometime in the afternoon. After about twenty minutes I could see him call his dog over and walk towards me over the dam. I refilled the kettle and putting it back on my stove walked over to meet him. “Hi, Bill Livingston” I said cheerfully, “You must be Robert Fox” and stuck out my hand. “Err… no” I replied, wondering what to say next. He was still smiling at me. Maybe he's gay, and he thinks I am, I thought. How the heck am I going to get out of this? Just then, thankfully, my kettle started to whistle. “Cup of tea?” I offered. “Thanks” replied Rob and we walked off the dam wall, past the boathouse and into my pitch at Willow. I was pretty sure that this was all going to resolve itself without either of us getting any more embarrassed and, over a cup of tea, the conversation soon turned to Redmire and stories of the carp that had once inhabited the place not so many years ago. It seems strange to think that I had started fishing at the time Redmire was coming to the end of its 'glory years'. 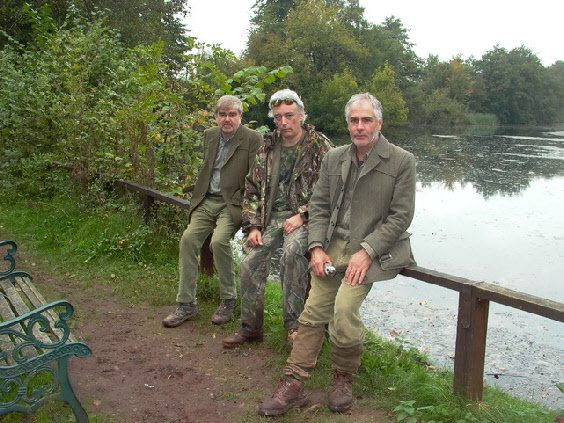 Chris Yates and Rod Hutchinson were fishing Redmire while I was fishing at a little pool near my home in Newmarket. I was then a schoolboy spending summer holidays cycling with a few friends to the nearby village of Burwell, there to fish a tiny pond that was rumoured to hold carp. We never caught one, but the dream of hooking such a glorious fish was always there. Chris Yates is a strange looking man, according to Rob. Piercing eyes and long slender fingers. 'Wizard-like', as Rob described him. Rob had met him many times and was quite taken with his understated angling ability. He doesn't seem to do anything particularly clever or unique. He adopted no unusual tactics or special rigs, no secrets that could be passed on, but had a hunter's ability to blend with his environment, to become a part of it, and to observe. It was this ability that made him so successful at Redmire. He was tuned in to the place. Something I had noticed I found difficult to do. Time, at Redmire, for Chris Yates, seemed to stand still. For me it rushed past, and at every blurring second I could see what I should have done, what I should make time for… to relax, to settle. Rob was saying that his brother had that same ability. He would walk round Redmire with his single Mark IV and cast when he found fish and felt comfortable. Rob's brother managed fourteen fish at Redmire in one day. Most were small he conceded, but there were a couple of twenties caught too. I talked to Rob about this and he laughed and said that many anglers come to Redmire to 'touch base' with why they fish. To get out of the mind set that determines their normal fishing lives. Martin Locke still fishes there from time to time as do many other well known anglers. Not to catch 'trophy fish', because there are none any longer at Redmire. No, they come because they know they will experience something they cannot experience anywhere else. They come home. We began to talk of tactics; was there a Redmire solution? No, not really. Observation, application, patience, getting 'into' the environment. Getting 'in tune' with the place. It either happens or it doesn't. Light leads seemed to be a successful tactic. Cast onto the weed beds. Rob said that Redmire carp 'graze', they don't go rooting around the bottoms of the weed like you would expect. They take bait off the top of the weed, so, small light in-lines, small baits, with a few loose offerings around the hookbait worked well if you were fishing to observed fish. PVA foam was recommended. Light leads with PVA foam to help the rig settle on top of the weed was definitely a technique that had proved successful when the pool was at its most weedy and difficult to fish. Large baited spots were also more productive than once was the case. This was interesting. I asked about this, as I had often heard stories of Redmire carp feeding on huge beds of bait, clearing the whole lot up, only to leave the hook bait until last, then swimming off, leaving the hapless angler to wonder what it was that made his carefully tied and disguised rig so obvious. The last couple of years have seen quite a lot of fish spawned and this year these fish are really quite numerous. They are still small, between about a pound up to around three or four pounds, but there are lots of them. When, in the past, the larger fish would either feed slowly and carefully before moving on, they have, by necessity, had to become quite competitive. Redmire fish are fished for every day of the year, outside the close season, and so are used to being angled for and are used to feeding on a wide variety of bait. Anglers baits are therefore almost a 'natural' food source and in order to ensure they get their fair share of this they have to muscle in on their smaller cousins and this has made them less wary. Rob is convinced that this is one of the reasons so many of the larger fish have been caught this year (along with a very much larger number of 'scamps'). Nearly twice as many fish have been caught at Redmire this year compared to last year. More twenties had been caught and the thirty had been caught a couple of times. So, it seems, it is getting easier, although I wish someone would have told the fish during my week. So, large areas of bait may well now be productive. That is worth knowing, and gave me a lot more confidence that 'standard' tactics might well work. I'll have to think about this and plan accordingly for next year (and there will be a next year, I assure you… I'll be on the phone to Les like everybody else…). Over the second cup of tea we began to talk about other things. I mentioned the fact that I was in the process of separating from my partner and talked about the trials and tribulations of dealing with lawyers, money, the house and having to manage the relationship with the children as carefully as possible so as to make the whole bitter experience as palatable as possible for them. It turned out that Rob had gone through exactly the same thing a few years ago but things were far better now. Like all of us who have had to go through this, he l lost his home and a considerable amount of money, but, all things considered he was happier now than he had been for many years. It was a very good conversation. I had begun to spend time thinking about my son and my impending separation and that had taken the edge off my week at Redmire. I was feeling guilty just being there and not at home with him. But we talked of him coming with me in a few years time, and we talked of his first carp, an eight-pounder from our local water. Rob could share the same experiences, and he talked of his children fishing at Redmire. Armed with my recently-gleaned knowledge, and not a little optimism, I decided I would once more walk down to the shallows and fish as simply as possible with my MkIV and some sweetcorn. Just as I was preparing my move I heard another shout from Richard's swim across the lake. I dashed round to see another, smaller, carp that Richard had landed from the same swim as his success of the previous day. It was about six pounds or so and was as beautiful a colour as his seventeen pounder of the day before. It was quickly dispatched into the pool once more and we decided on another celebratory cup of tea and some cake. Gil once more provided the tea, Richard the cake and Ian came up from his swim on Greenbanks to join in the fun. 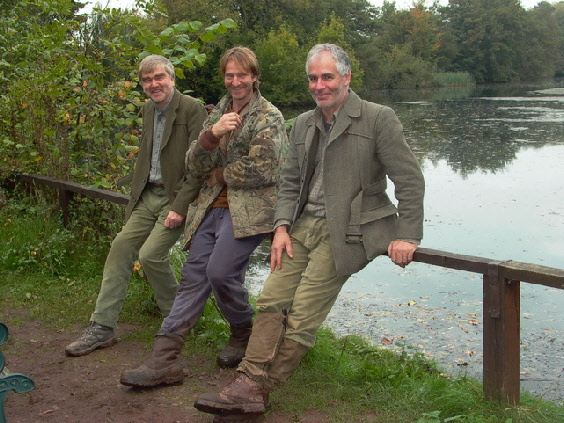 Gil, Ian and Richard on the dam, Redmire Pool. I haven't spoken much of Ian. A really nice guy, absolutely determined to concentrate on his fishing and every bit a traditionalist as the other two. There was a difference though. Where Gil and Richard had B. James and Son, Mk IVs and antique reels, Ian had a mismatch of old sea rods and coarse rods that had probably never even seen 'better days'. But what he lacked in tackle, he more than made up for in stealth and watercraft. I had been fishing within twenty feet of him when I was down in the shallows and not noticed him. In the end I gave up looking for Ian, if I wanted to find him I would wait for a gentle cast or try to see his rod poking out from under a tree branch or from a patch of reed. He would occasionally wander over for a tea or a walk over to the dam to look for fish, but other than that he just disappeared for hours on end, I was sure he would catch. He just seemed to have adapted to Redmire and become part of the place. After tea I decided to go and get some light inline leads and replace the bait that I had inadvertently left in my freezer in the garage in the rush to get here the Friday before. I drove into Ross and, finding nothing I was looking for, decided to go a bit further afield. I drove down to Lydney where there was a reasonably well stocked tackle shop. I bought a small knife and a few small leads. I had found a rig in the trees by the dam with an inline lead that must have been less than an ounce in weight. The smallest I could find were one-and-a-half ounces, and looked impossibly large compared to the one I had retrieved. On my way back I noticed the wind had got up and rain was looking ever closer. On arriving back at the pool some two or three hours later I found Richard had had another carp, again, around the six or seven pound mark. He was doing well, all from the same swim, all about two rod lengths out, all on boilies. I was too late to go down to the shallows and, with the wind blowing the dead weed into a fairly large platform right in front of my swim, I decided I would be better advised to set up my rods for the night and think about stalking the next day. I had noticed a clear patch in the silt and weed when I was sitting on the punt earlier in the day and thought it would be a good place to put a bait. The problem was, it was an impossible cast as the trees overhung the boathouse. There was no other way. I had to use my baitboat. I put in four or five large handfuls of mixed pellet and then poured about three quarters of the Mainline Pineapple I had bought that afternoon into the hoppers. My lead was already in the boat hanging over the centre and to it I clipped my hookbait. A carefully constructed snowman with a 14mm Pineapple bottom bait and a heavily glugged Pineapple pop up, the smallest I could find in the jar. I felt so confident. I put the boat into the water and drove it out over to the boathouse. When it got to alongside the punt I stopped the boat and walked round. Just as I was doing so, Ian came up and asked what I was doing. I explained. He nodded and then decided that now would be the time he would tell me that Gil hated baitboats and was likely to take a shotgun to it. Great. He then said that he too didn't really agree with them. Wonderful. I'm trying to place my baits as accurately as possible and now I am going to get into a baitboat discussion. I got into the punt and drove the boat back to me. Even though the light was going I could still see the spot I wanted to fish reasonably clearly. I pulled the baitboat out of the water and removed my rig. Now I had got my line and rig round the corner and under the trees, I could place my baits and hook very accurately indeed. Ian sat and watched me put on my Polaroid's and chuck a few handfuls of the contents of my baitboat hoppers into the water on and around the clear patch. When I had done this, I put on a piece of PVA foam over the hook and, with a gentle underhand lob, dropped it into the water alongside the patch. I even saw the foam release and the snowman drift slowly down to settle on the bottom. Perfect. Well. That was one rod perfectly placed. I got the other two sorted and then thought about something to eat and another cup of tea. All done. I settled down to read for a bit. Within minutes I heard a beep on my right-hand rod, the one I had positioned on the clear patch between the dam and the boathouse. Yes! I looked out under the trees. Oh no - the bloody swans! Redmire has a pair of swans and one cygnet. They were the most annoying birds you will ever meet. No matter how stealthily you walked around, the damn things followed you everywhere. They seemed to hide when you stopped, then wait for you, because they knew you were going to bait a swim, and if you did, they'd get a free meal with little or no effort on their part. There, in front of my eyes, the bloody things were eating the best part of two kilo's of the bait I had driven miles to buy and then spent ages getting it placed. Everything had been perfect. With not a little frustration, I reeled in the rod. The last thing I need was to hook one of the damn things. I slung the rod down. No point in trying to cast blind now the light had gone. Besides, I was too angry. Two rods tonight. Wind is getting up. Big weed platform right in front of me. Brilliant. I put on the kettle, made a cup of tea and filled my hot water bottle and climbed into bed. I put the radio on and promptly fell asleep. Something woke me. I looked at my rods, nothing. I looked outside and saw a light from Richard's swim. I idly wondered whether he had had another fish. I tuned the radio to the news and then listened to the forecast. 'South Wales, rain moving north-east, heavy winds (you could say that again, it was already pretty bad) and then in the early morning, gale force winds and heavy or even torrential rain, with the possibility of flooding'. Fabulous. Then another bleep from over the lake. It was Richard! I dashed round just in time to see him return his fourth Redmire carp. It was one in the morning. I had passed Gil who was sound asleep in his open bivvy. I couldn't understand how he had slept through the alarm when he was in the next swim, it had woken me from over the other side of the lake. Still, I was up, which proved to be a good thing. I told Richard I had heard the weather forecast and warned him that gale force winds and torrential rain were on the way. I was seriously thinking about getting my wrap out of the car and putting it over my bivvy, but at one o'clock in the morning in heavy wind with a few drops of rain in the air and the strong likelihood of very much worse almost imminent? Sod it. If I didn't put it up and I got a drenching I would regret it for the last couple of days, so, armed with my head-torch I did just that. I put the extended wrap on my Armo and, just as the last peg was pushed in the heavens opened. If you have ever experienced rain at Redmire you will know what I mean… I thought it was bad enough last year. Unbelievable! The weather forecasters had got it right, it was absolutely torrential, with really heavy winds. Gil must be getting a soaking. Wonder if he is awake yet? The next morning I got out and looked around. The trees had lost a lot of leaves overnight and the dead weed and leaves had collected in a long tight line all across the end of the pool. My lines were completely wiped out with the drifting weed. Still, I was warm and dry and had survived the night. It was time for a walk about. It was muddy before the storm, but it was a quagmire now. The mud now sucked at every step, this is going to be miserable. I half walked and half slid round to the east bank to see how the others had fared overnight. I spent the morning down at the shallows. It was really difficult to move around down there after the storm, but I could see some fish and I only had one more day, so I was determined to try. Several hours later and it was obvious there was nothing doing, although I did see the big common again. Richard fished on the Three Islands platform opposite his main swim. It was clear by now that most of the fish were sitting in the middle of the pool, in the square formed by The Stumps and Greenbanks on the east bank and the Three Islands and Woodcote Platform on the west, with occasional forays down to the shallows or up towards the dam. Gil was still fishing at Stumps but had placed a rod at the Fence Pitch as well. I decided to walk down to the Lower Pool, through the wood, to see what it looked like. The Lower Pool, as the name implies, is slightly further down the old stream course on which Redmire Pool was first formed all those years ago. 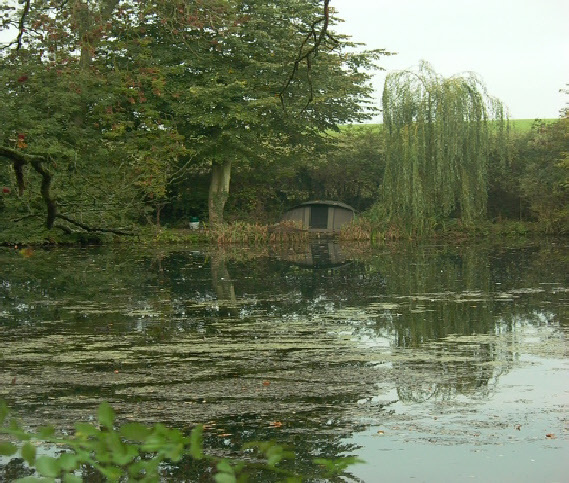 This smaller pool is about 60 yards long and about ten yards wide and contains a number of carp from the main lake. No-one is allowed to fish it of course and it is pretty unfishable anyway, with pondweed covering the whole water. After a bit of a wander about I made my way back and took some pictures. Ian decided to float fish off the dam wall overnight and, at one in the morning, I took him over a cup of tea and some Jaffa Cakes and we had a chat for a few minutes. It was quite a civilised thing to do on our last day. That night, I had my second Redmire carp. This time it was a common, which I placed into the basket by the dam as requested. Only small, but welcome nonetheless. Once more on my MkIV, and again on sweetcorn. Gil had a take too, but the fish took him straight into the weed were it stayed, unmoving, for what seemed an age. Eventually all went loose and Gil wound in. So, the week ended. Richard had four fish, I had two and lost one, Gil had none landed and lost one. Ian, who I was sure would catch, had nothing at all. But to count the score misses the point. It was a fabulous week. I met three really nice people who made it feel like Redmire should feel. They appreciated where they were and that made it even more wonderful for me. I will certainly go again. I have a slightly better idea of what I need to do. I will definitely try to get an earlier session as the nights are just too long in October. Redmire needs to be seen to be appreciated and long wet and windy nights are not the stuff my dreams are made of. Perhaps I'll try for early September? September certainly fished well both this year and last year according to the logbook. October always seems to be a bit quieter. Not sure why, I would have thought they would be getting down to some feeding up for the winter, but with Redmire being fished all through the winter perhaps they know they don't need to? Next year I will definitely take some waders. The Shallows, from any point from Greenbanks down, is basically unfishable without going in. And regardless of what you see on Passion for Angling, I wouldn't want to be wading around in that silt and mud… A boat would be useful, just something small that I could use to place baits. I wouldn't need any different tackle, apart from some light leads. Last year my target was to get there and I did. This year I wanted to catch and I did. Next year I want a twenty, or maybe even the thirty. Oh, and next time I will book all four places for a week, rather than a single place for me. I have already had a number of friends mention to me that they would fish with me next year. Well, if I can get through again, I will certainly let them know.